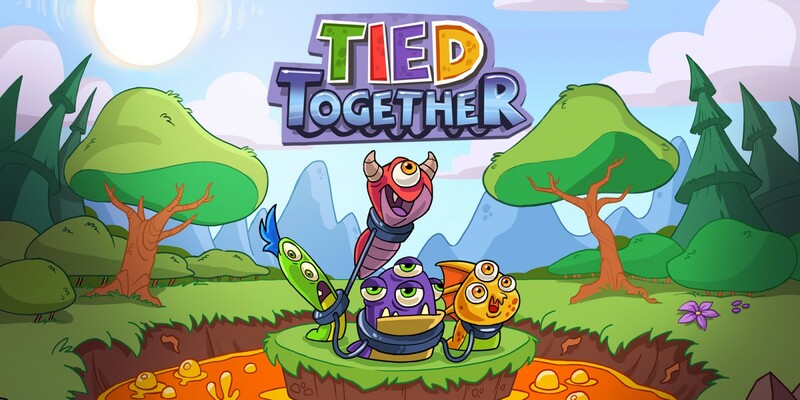 Tied Together is a co-op game involving monsters and seeing how well they can cooperate together. It’s a cute game and one that really tests your teamwork skills. This game is 2-4 players and involves a lot of cooperation and communication. The beginning is fairly easy but each level gets trickier. Tied Together has simple enough gameplay. Each player controls a little monster and all of the monsters are tied together. The monsters must work together in order to reach the end of each level. Controls are simple, with jump, punch, and anchoring yourself aside from moving left and right. Each control has a purpose as well. You can dig yourself into the ground in case your partner needs to make a dangerous jump over lava. It makes it easy so you don’t hurl both monsters into the pit. The characters die after one hit and your partner can revive you by punching you. If you both die, then the level restarts. There’s no death counter or lives though, so you can die and retry the levels as much as you want or need to. There are around 40 levels you can try to beat in Duo Mode with two players, and an additional 20 levels in Party Mode with 3 to 4 players. Depending on your time in beating the level, you can get a bronze, silver, or gold rank, so it can be a challenge to retry levels to beat your timed score. I think it would have been interesting had there been a Versus mode, where two teams of two players raced against each other in a level, either with a split screen or while sharing a screen. I agree. Even though it’s a game about cooperation, having a versus mode would add a lot to it. It’s local only so having two teams shout at once would be a lot of fun. Each level is short and once you beat it, you get your score and move onto the next level in a heartbeat. There’s not a whole lot of transitioning. The graphics are nice and bright in this game, and the monsters’ designs made us laugh. They’re a bit goofy as they move around together, and they became endearing enough for us to actually care when the monsters, um, “deflated” when being impaled by spikes. The designs of the monsters are cute. I enjoyed our characters hobbling around each level and their subtle voices were funny to listen to. Unless they died – which happened a lot – then they could grunt and groan as though they were annoyed we kept killing them. The music wasn’t too bad at all, but we were talking more to each other, trying to figure out the physics of the individual levels that would let us reach the goal. It was catchy enough, and sometimes a bit of a contradiction when it came to the monsters dying, but not something that tended to get stuck in our heads while we were trying to cooperate with each other. One day, scientists were bored so they created four tiny monsters to test their cooperation skills. The monsters then go through a series of short levels tied together to make it to the end as the scientists observe them and prepare the next level. That’s pretty much the gist of the story. The monsters are transported to each level by these scientists and they time the monsters to see how long it takes them to work together enough to make it to the goal. It’s not in depth, as the main focus of the game is playing with a friend or three rather than going on a lore-filled quest. This game is only for two to four players, meaning people who like to explore on their own are out of luck. The levels are short and sweet, as long as you can cooperate together well enough, and the puzzles can be interesting and challenging the first time around. The replay value of this game comes depends on how many friends you have to create new teams to experience the levels with. It’s not bad at all, and there are plenty of levels to complete, but you can only replay a level so many times (or be stuck on it for so long) before the novelty wears off. Overall, this is certainly a great party game. It’s tough with two players but having four players on the screen is harder. It can get chaotic with a lot of laughs and a lot of frustration if you don’t communicate well. This is certainly one to try if you’re looking for a new, fun multiplayer game to play with your friends.